If you wish to book a JOYRIDERS holiday, please read and understand the following Terms and Conditions. A contract shall exist between you and JOYRIDERS once a deposit has been received. Deposits are non-refundable. Your booking will be reserved for 24hrs from the time of receiving your invoice. In this time we require the deposit detailed in your invoice to secure your booking. If no deposit is received in this time then the booking will be cancelled by us and the place requested will be made available to other guests. Final balances must be received 60 days prior to arrival. Failure to pay on time may result in cancellation charges. If you are making a booking less than 60 days before the start date of your holiday, full payment will be required at the time of booking. Comprehensive Medical Insurance (covering air evacuation) is mandatory on all JOYRIDERS mountain bike holidays. Our trips can take place in remote areas where there is often little access to normal medical services or hospital facilities. Sometimes evacuation can be difficult and expensive. Medical and evacuation expenses will be the responsibility of the participant. Trip participants are responsible for purchasing medical insurance. Trip delay: can recover expenses whether your trip is interrupted, delayed or you miss your connection. Baggage and Personal Effects: Protects against loss of damage to baggage. To transfer to another holiday you must notify Joyriders at least at least 60 days prior to arrival. A transfer fee of £150 per person is payable, plus any increase in holiday cost. Joyriders reserve the right to refuse any request to transfer to another holiday. JOYRIDERS cannot pay any compensation, damages, expenses, costs, losses or any other amount of any description if we or your airline have to change or cancel your flight or holiday, or your flight cannot be provided as or when agreed as a result of circumstances or an event beyond our control. Such circumstances will usually include war, terrorist activity, civil/political unrest, industrial dispute, fire, natural or nuclear disaster, bad weather and all similar circumstances and in all such cases whether, actual or threatened. No refunds will be made for a cancellation during the course of the tour, nor for unused portions of the trip. JOYRIDERS reserves the right to cancel a trip if the minimum number of clients for a trip is not fulfilled. In such a case, refund of payments received by JOYRIDERS shall be returned in full. Please note that once trips are scheduled, cancellations by us are extremely rare. JOYRIDERS cannot assume responsibility for any loss incurred on account of non-refundable air tickets. Please contact JOYRIDERS prior to purchasing your flight as to confirm that the required number of participants have signed up for your trip. JOYRIDERS reserve the right to cancel (without refund) riding under adverse weather conditions, i.e. when we deem it too dangerous to ride. Each participant is responsible for booking their own flight to the city where the trip begins. Please note most airlines charge an additional fee for bikes. Fees can be expensive – ensure that you confirm the policy before finalising your booking. For all trips, we will set a meeting place and time at the airport on Day 1 of your trip. If you wish to stay longer, or arrive earlier, please notify JOYRIDERS so that we can help you to arrange your travels. Please contact us before you book your flight to confirm that the trip has enough participants to run the trip. Where necessary we will arrange vehicle transfers (in some instances internal flights) to assist with the logistics of a trip. All transfers provided by third party suppliers are taken at the participant’s own risk and JOYRIDERS take no responsibility for the provision of these services. Where a client takes up the services of a third party, the terms and conditions of that company apply. The single supplement is an additional fee for participants that request their own room for the duration of the trip. If you are travelling on your own but do not request the single supplement JOYRIDERS will pair you up with someone of the same gender. If you are travelling on your own and there is not another single person of the same gender the participant will be required to pay the single supplement fee. Participants should be healthy and active and they are strongly advised to follow our pre-departure fitness training recommendations. It is vital that persons with medical problems make them known to us well before departure. Hospital facilities for serious problems can be difficult to source and evacuation can be prolonged, difficult and expensive. JOYRIDERS assumes no liability regarding provision of medical care. It is a fundamental booking condition that you accept that certain activities such as mountain biking can be hazardous and may involve elements of risk or discomfort, and that you take personal responsibility for your own actions. JOYRIDERS take no responsibility for damage, death or injury caused to you or by you as a result of participation. You must at all times participate within your own ability and always wear approved safety equipment. Trip participants have a certain responsibility to JOYRIDERS and other trip participants. 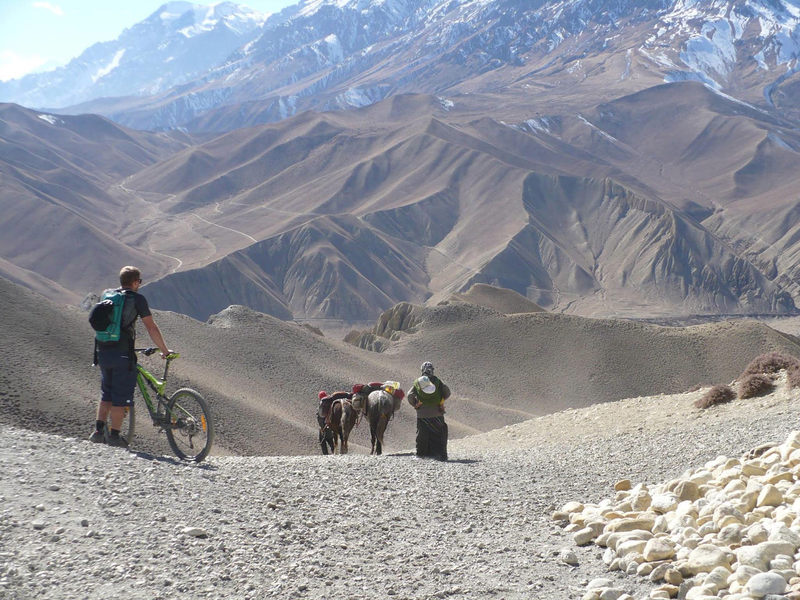 Trip participants are responsible for: understanding the conditions implied in the Trip Itinerary, selecting a trip that is appropriate to their interests and abilities, preparing for the trip accordingly and having the proper bike and equipment needed for the selected trip. A participant may be asked to leave a trip if the leader feels that the person’s continued participation may prove detrimental to the individual or to the well-being and enjoyment of other guests. If you have to drop out of a trip you will be responsible for any travel arrangements or additional costs incurred. For those participating in cycling and mountain biking – whether hired or belonging to you – it is your responsibility to arrive with and keep your bike in safe working order. Helmets must be worn. Other protective gear is highly recommended. RECKLESS RIDING WILL NOT BE TOLERATED ON ANY JOYRIDERS TRIP. Photographs and videos: any likeness or image of you secured or taken on any of our trips may be used by the company without charge in all media (whether now existing or in the future) for bona fide promotional materials of any kind, such as brochures, videos and the internet. We reserve the right to update and/or alter these terms and conditions at any time. It is your responsibility to be familiar with these terms and conditions.